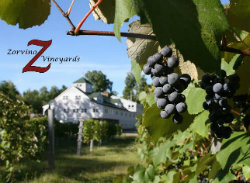 Zorvino Vineyards is a family owned and operated winery that originally started as a hobby. Jim and Cheryl Zanello purchased the 80 acre lot in Sandown, NH in 2000 after retiring. 4 years later Zorvino Vineyards was established. The “Zor” in Zorvino comes from the original family name Zorzanello and “Vino” which means wine. Family and Wine… the perfect pairing. In the first years, 150 cold climate vines, mostly hybrids, were planted. To date, there are roughly 2000 vines on site. The bulk of our grapes are brought in from Italy, California and South America. We are most known for our “off dry” fruit wines, blends and unusual 100% fruit or vegetable wines like Pumpkin, Beet and Rhubarb to name a few. New favorites include our red wines and white wines aged in American White Oak. We have wines for every preference. The barn like structure was never built with the intention of becoming a function facility. The post and beam design appealed to many visitors and its rustic elegance led to many requests for special events and weddings. This is how the journey into hosting weddings and special events began. The wood work, tasting tables and most of the creative details were thought up and implemented by hand by Jim Zanello utilizing wood from the property. The combination of the beautifully landscaped grounds, rustic ambiance and large variety of wines has not only made this a perfect place for a wine tasting or a wedding but a successful venture as well. With the hard work of our extended Zorvino family, the winery and function facility continues to grow and prosper. We are very thankful for the support we receive from our local community and our extended supporters outside of the community and state. Our winery is open daily from 11 am - 5 pm. Also sold at NH State Liquor Stores, Hannaford, Market Basket, Shaws & many other gourmet shops throughout NH. We make wine from pumpkins, beets, & tomatoes and our own Pesto Dipping Sauce from our basil. We have over 2000 American hybrid grapevines and make over 30 different types of wines. We also grown apples, peaches, pears on our property as well.